Lighting a minivan back window! Worked fantastically in our camper! We got these for our pickup camper. They produce a warm bright light that is just dandy. I'm very happy with the power draw as well. Thanks much! Nice bright lights! Minimal electricity use, we used for a trade show. Sure got attention! I have looked for low voltage Lights that can connect to my Cig Lighter in my Van.The use is for my awning for my Vanagon...Perfect Perfect. 12V Christmas lights are ideal for use where you have landscape lighting but do not have access to 120V source. A full wave rectifier is needed (very low cost but you need to have basic wiring knowledge) however if you have AC landscape transformer. This can be connected at the existing light source you plan to switch over to Christmas lights or tapped in directly to the transformer and does not need to be removed to reconnect the existing landscape spot or flood lights for example. I used the common 12V connectors used for battery charging which work well. I bought four strings for a small cabin. Nice mellow color, adds a lot of light to the room, connector system works well. Threw out all the DC plugs as I didn't need them, seemed like a waste. I bought these lights for my teardrop camper. They worked awesome! They were very festive and lit up the whole campsite. I might even buy a few more sets. I have 2 locals with these light strings The first is15 strings long on a border fence which I wired direct to my Malibu landscape transformer in the front of my house. The other lines the perimeter of my rear patio and is also connected to my other Malibu transformer. They light the area up just enough to see without flooding the area with too much light. I really like them. These were exactly what we needed for our Solar powered display. Easy plug'n'play. Each set I ordered came with an extension and a light string. I only need one extension to fire them up on my golf cart. Wish they would sell light strings only. I would buy more. I hooked these lights up to my 12vdc solar electric system, they worked perfect for my Christmas decoration at the end of my 600' driveway. We love these lights. The barely take any of our solar energy and light up our porch. Q: Do you have 12v warm white LED icicle light strings? A: Sorry, we don't carry 12 volt icicle lights at this time. Q: I will be using these on my sailboat. I would love to see how the connection looks when adding these in series. Does it require the bulky accessory plugs between each set? There isn't the bulky accessory plug between each set. 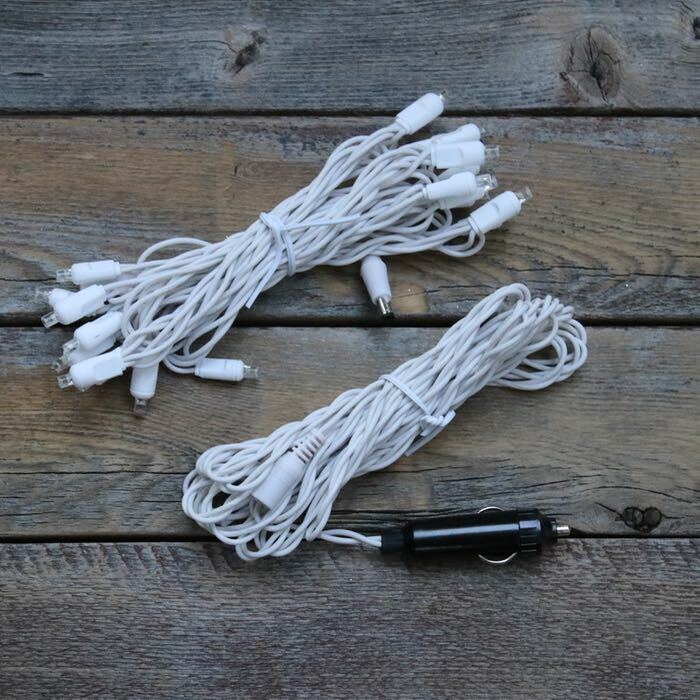 After the 15-foot accessory plug and wire assembly, each string section of lights has a smaller male or female connector at the end that is about the same size as an old speaker wire connector - a small cylinder with a single thick pin. Note that if you purchase 10 strings of these light strings and plan to use them in series, you'll have 9 of the adapter cables left over. These items are not sold separately. You might consider saving them in case you need a replacement in the future.